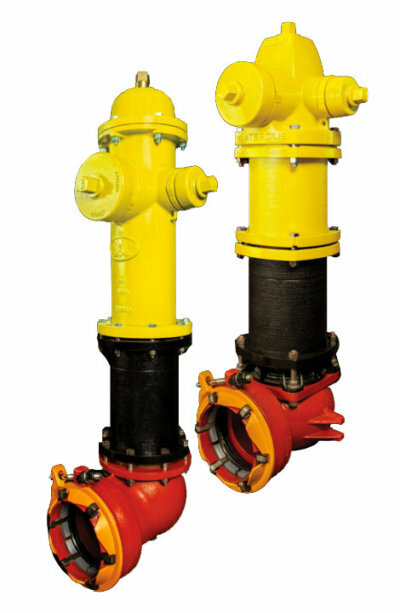 The ALPHA inlet is compatible with several pipe materials, including ductile iron, cast iron, HDPE and PVC pipe. Meaning it will work with just about any pipe material on the job. Compared to mechanical joint, which uses up to eight bolts on each end, the ALPHA joint uses only one top-mounted stainless steel bolt. This makes the valve with ALPHA ends easier to install, which saves time and money. The ALPHA joint is much more accessible than other end connections. Mechanical joints, which require bolts on the bottom of hydrant base, can be harder to install. ALPHA can be quickly and easily installed by one person in a fraction of the time it takes to install a mechanical joint valve. In some instances, the mechanical joint may require more than one person install. Unlike the mechanical joint, ALPHA comes with the restraint accessories attached. Another money and time saver. ALPHA also works with the pressure to achieve restraint. This reduces the amount of torque needed to achieve a solid connection.